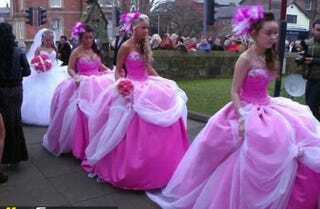 Okay, I am planning a wedding and am dealing with some clashing bridesmaids. It's gotten to the point where I don't really want to ask for input from them, because it sets off a whole firestorm. They do okay when I just say "Okay, I think we're going to X" but as soon as I ask for their feedback, the feedback can get a little bitchy and in-fighty. So, since I'm just looking for some general thoughts, I'm running my question by you guys instead! My bridesmaids are all over the map, body shape wise. Given that, and the fact that we're planning this wedding with not a ton of capital to throw it, I'm giving them a neutral colour and just asking that they pick a dress they feel comfortable in and will wear again other places. I thought this would take the stress off of me, because I don't have to figure out a dress that flatters everyone. But, instead, they each want me to pick out their dress. So instead of shopping for one bridesmaid dress design, I'm supposed to shop for four. I'm considering, instead of going dress shopping with each of them at one point or another, just pointing them to an Etsy shop I found, telling them I want colour swatch 106 or whatever, and here is a short list of 30 of their dresses that I think look nice. And the dresses are reasonably priced - the dresses plus shipping are at least equal, if not cheaper, in cost than bridesmaid dresses in shops. Is this reasonable? If you were a bridesmaid and could pick out a dress from a list of 30, would that bug you or would you appreciate knowing that all 30 of the options have been given the bridal seal of approval?